Live the moment. Use the mouse, monitor, and accessories youve grown to love with your new notebook. With a single USB-C hub you can connect up to 7 devices at once and keep your creativity flowing. The Nucleum has you covered whether you want to connect to a larger monitor or need to offload footage from the latest shoot. 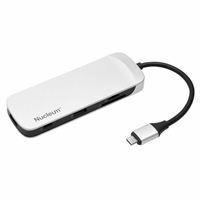 With the Nucleum you can power up your MacBook while also running your external hard drive and charging an iPhone. The compact size and built-in cable also make the Nucleum a perfect travel companion to take with you on location. * MacBook and iPhone are trademarks of Apple Inc., registered in the U.S. and other countries. More pixels " Need to work on something larger? Weve added 4K HDMI output to your new notebook. Charge " Get a little more juice while youre backing up your iPhone. Fill it up " Want to use all your connected devices at once? No problem, plug everything in and get creating! Portable " The convenient size means you can bring the USB-C hub wherever you need it. Creation station " Shoot, ingest, and edit your footage wherever you are using the SD and microSD slots. Made to match " The Nucleum is designed to complement your new MacBook. Ditch the dongles " No need to carry around extra dongles to connect your devices. Rugged cable " With the built-in cable you can be sure you always have a connection handy. * MacBook and iPhone are trademarks of Apple Inc., registered in the U.S. and other countries. 8.28" x 4.72" x 1.04"